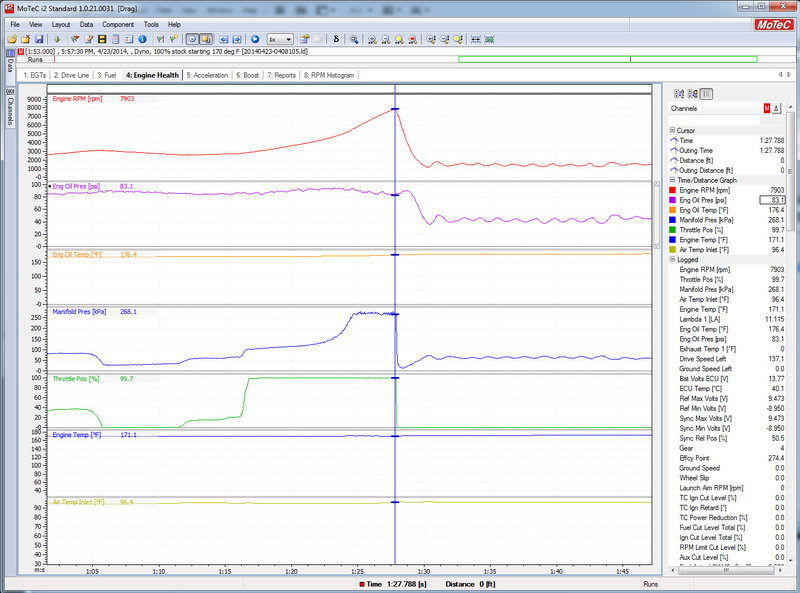 So to provide everyone with our data on Oil Filter Relocation Kits we did the following tests. This data is open for discussion. The setup and testing procedure took a total of 3 days worth of work with the test spanning across two days. We don't plan on doing any more testing. If you want further testing, feel free to handle it yourself. You may post your data in this thread, no problem. But, If you are going to post your data, please include as much information about your oiling system as possible and keep your data consistent an an apples to apples comparison. Your data in comparison to ours is NOT apples to apples. 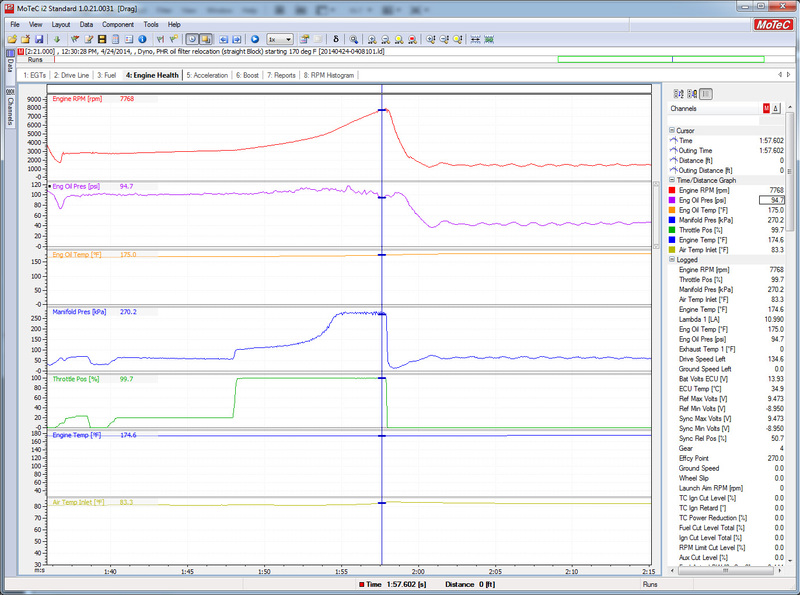 Your data should be a comparison of a change on your own vehicle/engine in a similar environment. 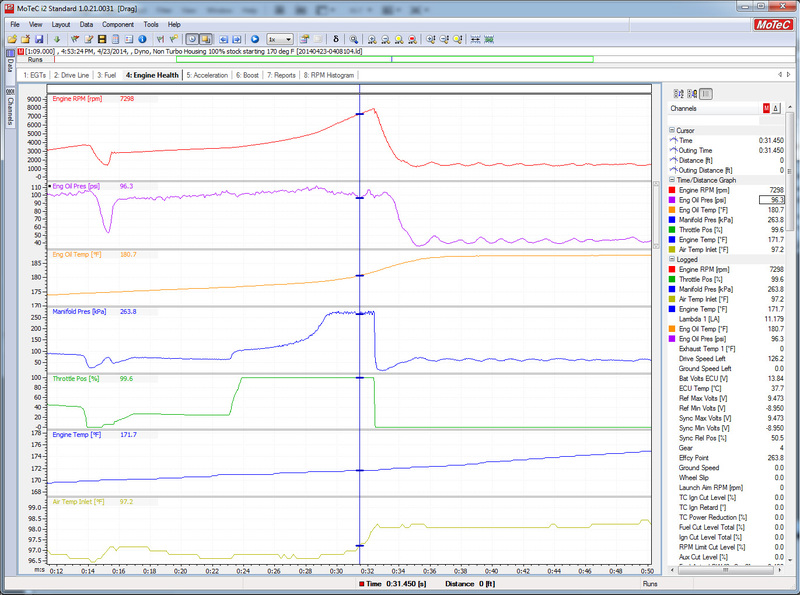 In each datalog, I have highlighted the lowest oil pressure observed during the pull. You can read the datapoints at any point on your own by simply looking and estimating what that data point would be. 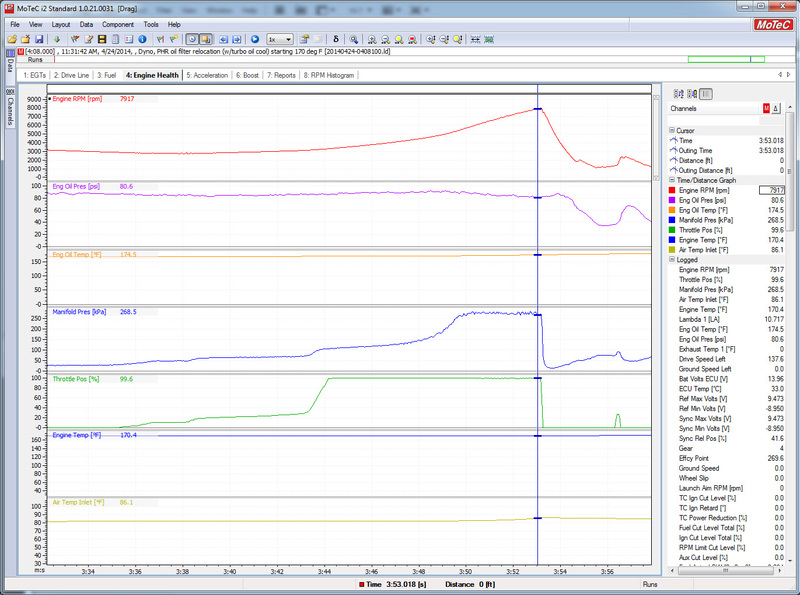 Trying to keep consistent between pulls, we logged oil temperature as well. Each run was started when oil temp reached 170 degrees F.
Each pull the car was making about 850hp and each pull there was no hp difference worth noting. This motor is a PHR Built 3.0L motor using factory crankshaft, CP pistons, Carrillo Rods. It is equipped with a PHR Modified Factory Oil Pump (yes it is shimmed). This is important to note because we will observe higher oil pressures than an unmodified factory oil pump. No, we will not be repeating the test with an unmodified factory oil pump. This test is for COMPARISON of the DIFFERENCE in oil filter setups not pump setups. We are comparing DIFFERENCES between oil pressure and how each setup changes the oil pressure. Run starts out about 94psi of oil pressure and averages about 90psi throughout the pull dipping as low as 83psi at 7400rpm and again at 7900. 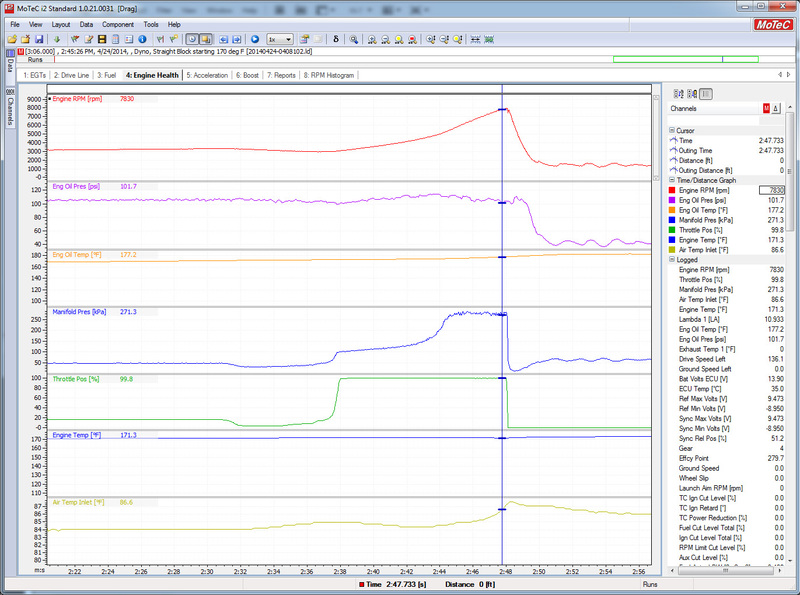 Starts out about 88psi averages about 85psi throughout the pull and dips down to the lowest of 80psi right at 8000RPM. If oil pressure is of concern to you (and it should be in a race application) then my opinion would be to ditch the factory oil cooler completely. If a Relocation Kit and oil cooler is needed then the results from directly off the block (no factory housing) exceeded all other tests... in other words, the factory oil cooler is a big restriction.